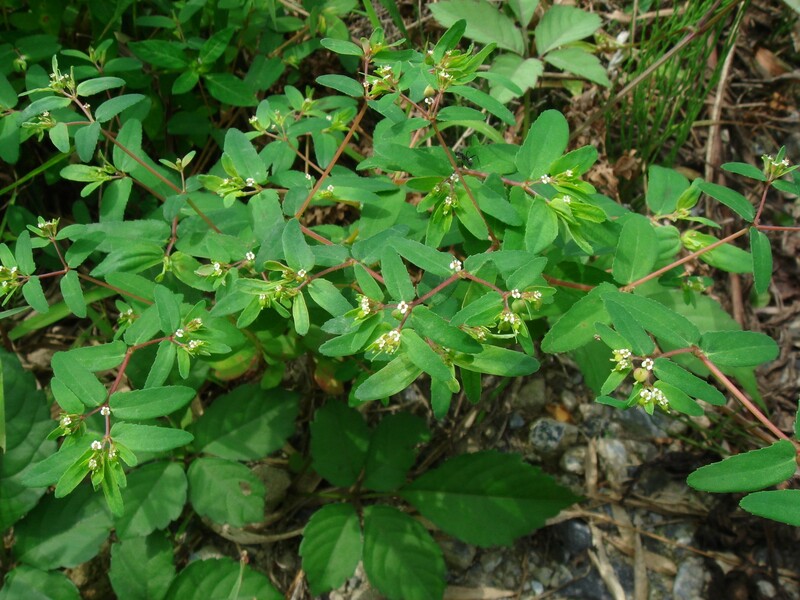 Chamaesyce nutans plant. Takato Natsui. Prof. Summer’s Web Garden. www7a.biglobe.ne.jp (Accessed 1/2018). Chamaesyce nutans is an annual herb to 80 cm, more or less erect, young parts finely hairy; sap milky, acrid. Stems often pinkish. 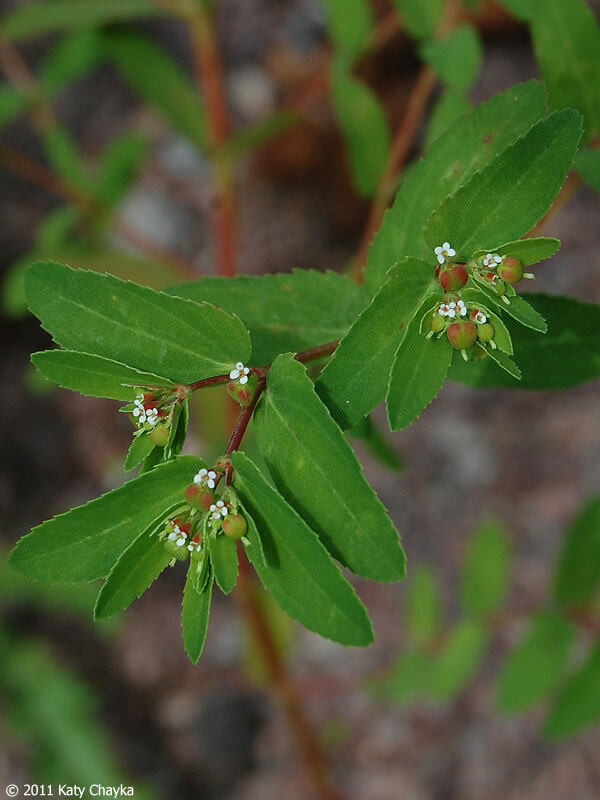 Chamaesyce nutans (nodding spurge) leaves and flowers. © 2011.Katy Chayka. Minnesota Wildflowers. minnesotawildflowers.info (Accessed 1/2018). Leaves opposite, oblong 1-3.5 cm long, about 0.3-1 cm wide, sides usually unequal, margin finely toothed. Flowers tiny, inconspicuous, monoecious, but males and females grouped together, axillary (use lens), stamen one, pistil one, several males surrounding one female, clustered above a lobed bract. 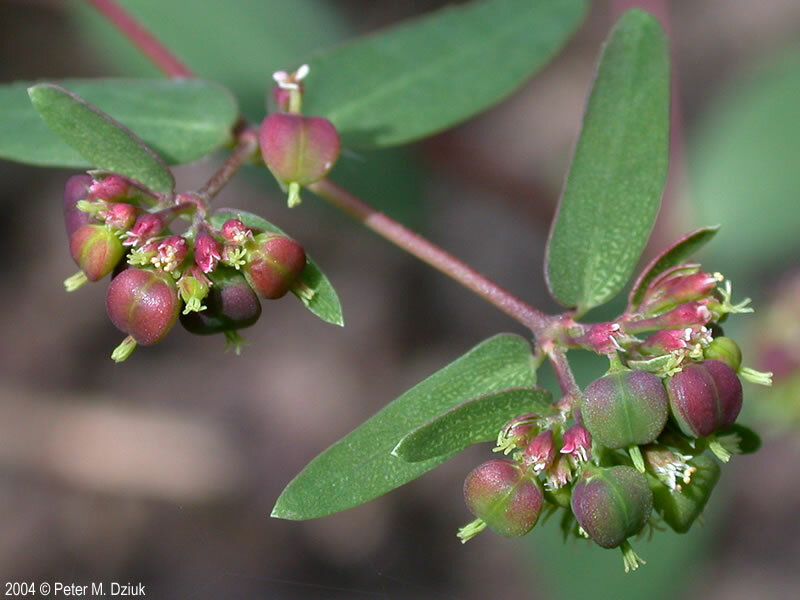 Chamaesyce nutans (nodding spurge) fruit. 2004 © Peter M. Dziuk. Minnesota Wildflowers. minnesotawildflowers.info (Accessed 1/2018). Fruit a dry, 3-lobed capsule, 0.2 cm long; blooms and fruits June-Oct.
Habitat: Open, dry, disturbed soil, lawns, ball fields, gardens.